Clinicians Choice — They Work! Retrieve Separated Instruments in Root Canal. 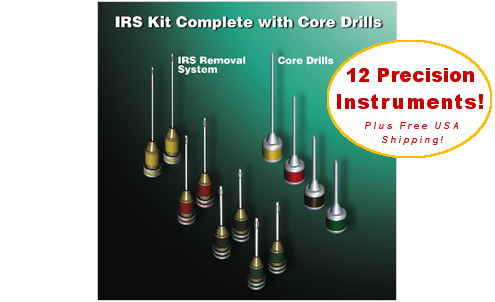 Core Drills remove less dentin than ultrasonic tips! 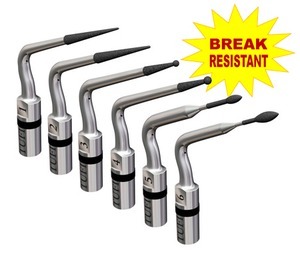 "The Kit Every Dental Office Should Have!" Exclusivvertrieb in Deutschland: JADENT microscopes and more. Fine troughing or separated instrument removal. Waterport for cooling and washing effect or can used be dry. 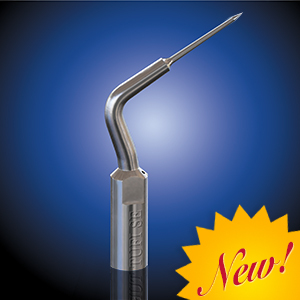 Features five replacement Trephines with matching Taps compatible with The Outpost and other Post Removal Systems. Engage and remove even the most intransigent post while preserving dentition. 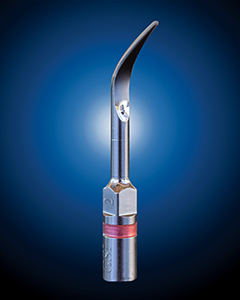 The Tufi® double diamond coated instruments are designed to be used in the access cavity, or above the pulpal floor and for finishing margins. 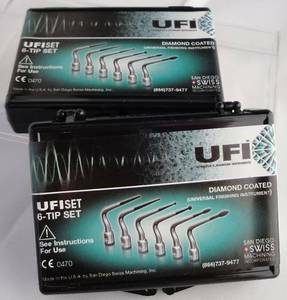 The Tufi® double diamond coated ultrasonic instruments are used for REFINING and FINISHING axial walls and line angles. (Glide Path) Cleaning the pulp chamber. Smoothing and finishing various restoratives. De-roofing peripheral dentin and flaring orifices. Eliminating internal triangles of dentin. Removing caries in difficult to access areas. Cut and countersink plastic carriers. The Ultrasonic Advantage: Using ultrasonic instruments greatly enhances your vision since you have no bulky hand piece to get in the way as you do with rotary handpieces. 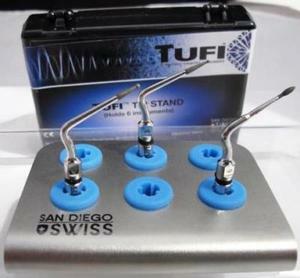 The Tufi® Double Diamond Coating is a unique and durable coating which offers resistance to sodium hypochlorite, has super efficient cutting action and has about 3X’s more diamond coverage than most competitive instruments. CLEARANCE SALE: BUY 1 TIP GET 2 FREE! Recommended for treating Supra-gingival scaling procedures. 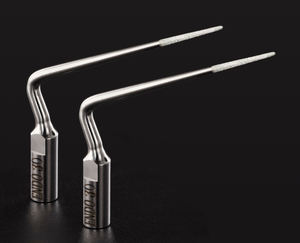 Double Diamond coated for removing supra-gingival calculus. More voluminous and complex supra-gingival deposits. Recommended for Sub-gingival treatments for the removal of deposits from the accessible root surfaces of the teeth. 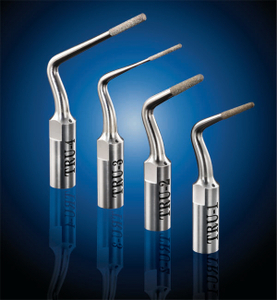 Use TRU MARGIN Restorative Tips for ultra precise prepping and fine finishing of the dentinal shoulder. The use of Tru Margin diamond coated ultrasonic instruments will enhance your preparations by creating a finer, gentler, more precise margin — a TRU Margin. Radius preparation tip, 12mm in length. Use for preparation of the dentine (chamfer shape). Use for preparation of the dentine and finishing the dentine (chamfer shape). Flat shoulder preparation tip, 18mm in length. Use for preparation of the shoulder shaping. Larger at the distal end for shoulder shaping and finishing. 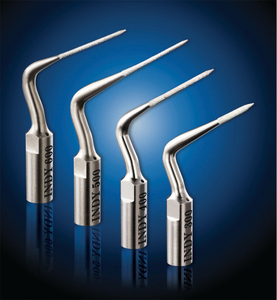 INDY tips are designed with an extended length of diamond coating for removing dentin and restorative materials along the lateral sides of the instruments. 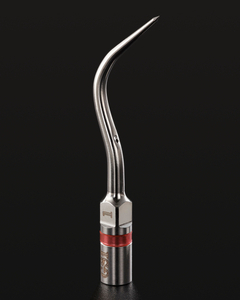 The INDY500 and INDY600 "Flex" Tips are long enough to work deep in the root canal. The INDY600 features a smaller cross-sectional diameter compared to the INDY300, INDY400, and INDY500 tips. 2-Pk 30mm Ultrasonic tips diamond coated for abrasive cutting and durability, removing Crowns, Bridges, Posts and the removal of difficult cement. 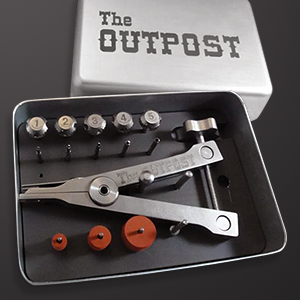 A variety of adapters are available for files, Euro-to-USA thread size, and female-to-male style handpieces.